Many movie-goers left the after-credits scene of Marvel's 'The Avengers' with curiosity as an unknown helmeted, pink-faced being turned to the screen and smiled, but in every screening, there was sure to be that one person who was involuntarily peeing themselves at the appearance of Thanos. Joss Whedon has made it clear that that Thanos will not be appearing in The Avengers 2 and will not face the group until the third film in the trilogy. However, Thanos will be appearing in the upcoming Marvel film Guardians of the Galaxy. 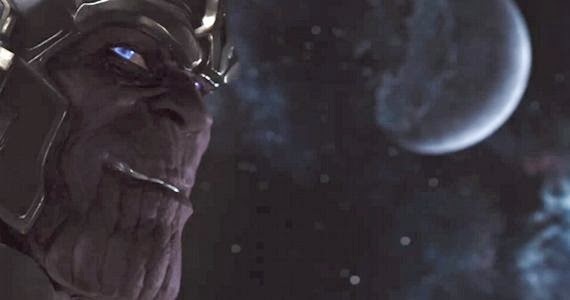 "An article on James Gunn's post-production process reported a scene with Thanos on a rocket throne in Act 3, which suggests an appearance long enough that someone is going to have to voice the Mad Titan, someone that could take the part into Avengers 3 as a major villain. That meant Marvel was looking for an actor of some caliber, someone that could give a performance to a very complex, but very purple-skinned alien villain.Our sources tell us that person is JOSH BROLIN!! He'll be providing the voice of Thanos in Guardians of the Galaxy and with a name and reputation like that, it's likely he'll join James Spader and Tom Hiddleston as actors who have tried to kill The Avengers." It does make sense for Thanos to be appearing, because one of the major characters in the film is the space pirate Nebula, played by Karen Gillan, who is the daughter of Thanos. Also, Thor: The Dark World's after-credits scene left us with The Collector collecting gems for the Infinity Gauntlet-Thanos' weapon of choice, if and the Infinity Gauntlet is coming, Thanos won't be far behind.